Once we were engaged last December, we knew that we wanted a small, intimate wedding party. The number of siblings we had worked perfectly. My sister and sister-in-law were my bridesmaids and Ambrose’s two brothers were his groomsmen. We all get along so well, it made perfect sense! I woke up the morning before our wedding in our hotel with a window that faced our venue, the Holland Center, with a view of our tent. It was a dreamy day full of happy tears and the most special memories. Here are the details of the morning before the wedding! THE HOTEL//MARRIOTT CAPITOL DISTRICT + GIVEAWAY!!! All of the ladies came to our suite at the new Marriott in the Omaha Capitol District. This room was perfect for all of us to spread out, get ready, and enjoy each other’s company on such a happy morning! The suites have corner floor to ceiling windows that allow such amazing natural light to come through. This is ideal for ladies doing make-up and hair. We also had a block of rooms which was perfect for our guests to easily walk a block to Holland for our ceremony and reception. Also, guests flying in from out of town were able to take advantage of the free shuttle to and from the airport. Additionally, guests were able to enjoy the vibrant restaurants and bars in the capitol district over the weekend! GIVEAWAY: Our friends over at the Marriott Capitol District in Omaha are giving away a weekend night stay to one our lucky readers! Simply follow us both on Instagram @clockingoutblog AND @downtownomahamarriott, so easy! If you want an extra entry, tag a friend in our comments section. 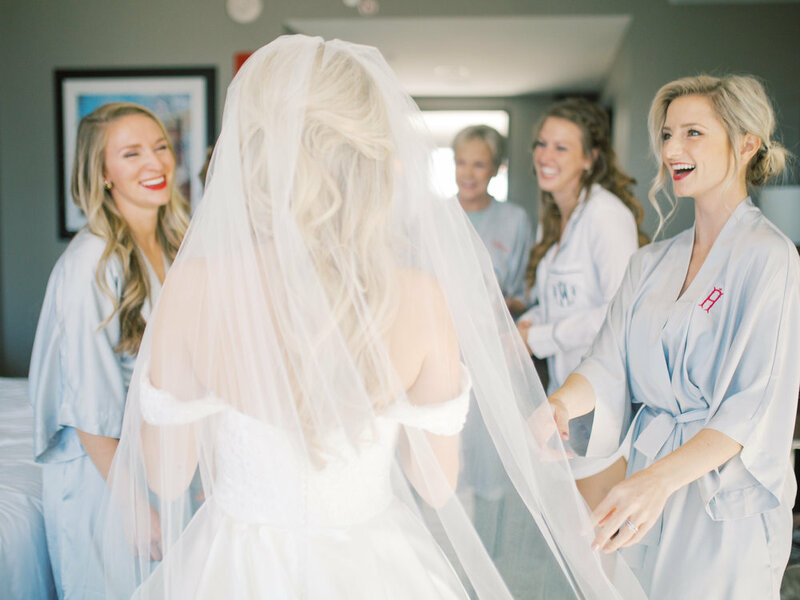 Kontempo’s bridal team came to the suite to assist with hair and makeup. The convenience of them coming to us was everything! They were wonderful to work with and very prompt which kept the flow of the day. Kirby added extensions to my hair the day before and created a romantic half-up do that was exactly what I hoped for on my wedding day. Kristen Roz was a makeup magician and even covered-up a scar on my elbow from the bachelorette party months prior with waterproof airbrushing! 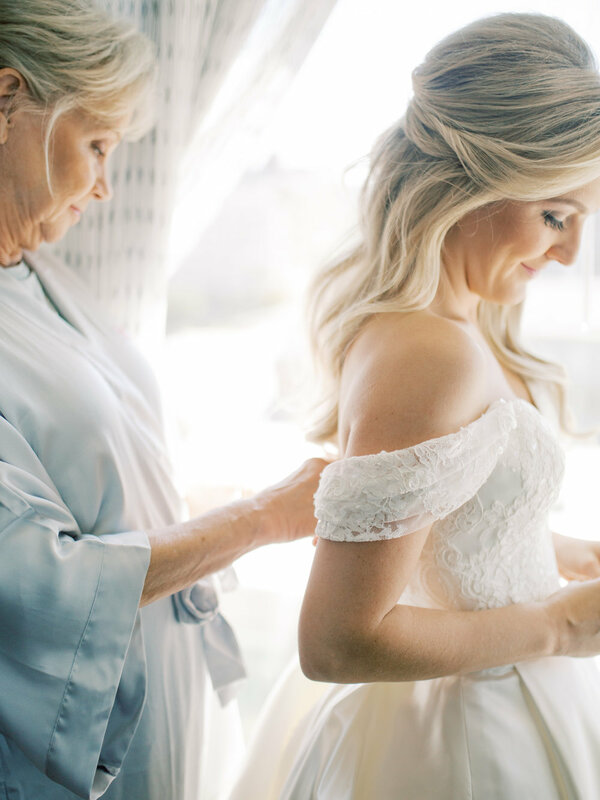 My mother, mother-in-law and bridesmaids all had great things to say about their hair/makeup and would highly recommend Kontempo Bridal to anyone! I had eyelash extensions put on a few days before by Emily at the Blue Door Salon. I am so glad I decided to do this last minute, no worrying about irritation from a strip of lashes plus they were beautiful! Tasha Baughman helped me get my brows into shape for the wedding. I plan to keep seeing her as she is a brow goddess. Lastly, I wanted a lip stain that I could count on to stay in place. After trying Jacki’s YSL stain I was sold, I bought the THIS classic rose shade #11. 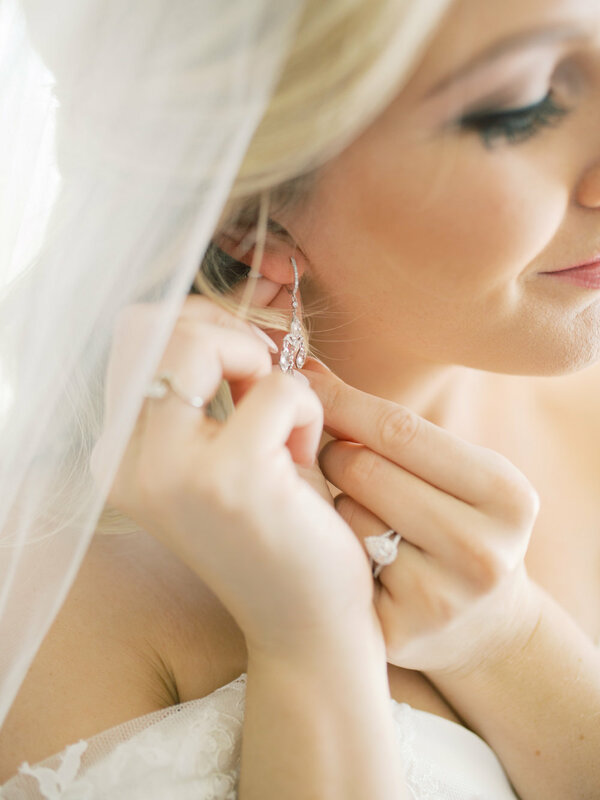 It lasted throughout the day with only one touch-up before the reception, highly recommend! My bridesmaids set-up the sweetest mimosa bar with custom stirrers! We popped champagne and enjoyed the morning. Also, pro-tip order lunch for your crew ahead of time and have it delivered so no one faints at the alter! We had Panera delivered and it was a life-saver. 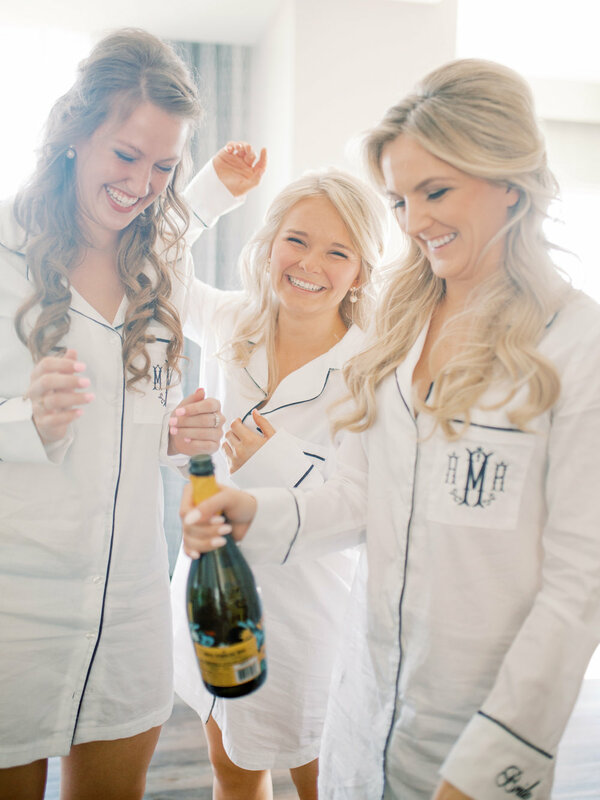 PJs, Robes, Gifts: I found classic nightshirts with navy piping on BHLDN that I knew would be perfect with a custom monogram! I added the date of our wedding and “Bride” to my sleeves. If you’re an Omaha local I highly recommend MINE custom embroidery. If not, find someone that does custom embroidery and monograms; it just makes everything feel extra special. The nightshirt I bought last year is sold out but THIS set from BHLDN makes for a very similar match. It would look perfect with the same custom monogram on the front pocket! Their gifts also included matching earrings from Kate Spade to wear on the day. My mom, mother-in-law and a few friends came to help get ready the morning of the wedding, and I had THESE ROBES embroidered with their first initial. All the details are linked below! Ambrose and his groomsmen/family dressed at our home in downtown Omaha. They watched the Notre Dame game while snacking on appetizers most of the day. 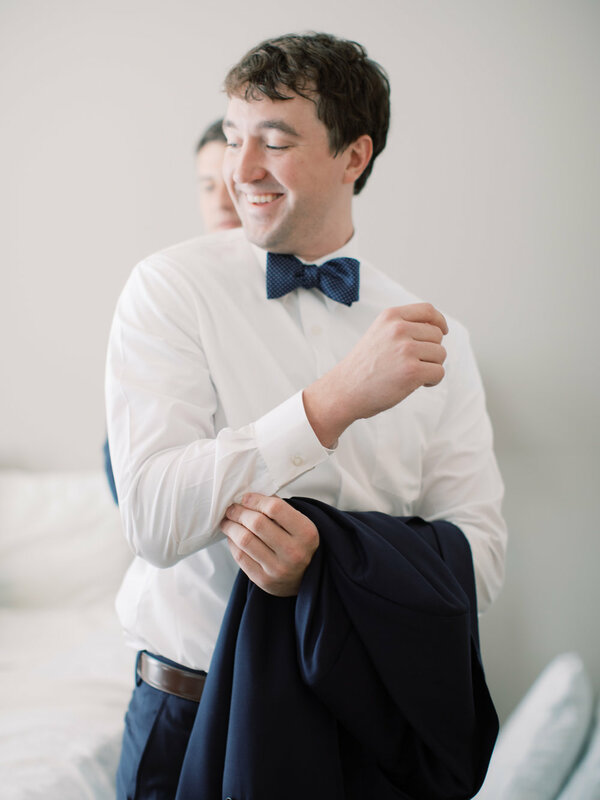 Once the photographer arrived, they decided they better get dressed…Ambrose’s hair may or may not be still wet from the shower in his pictures. Needless to say, they had a low-key relaxing day with a wee dram of scotch. The suits and ties are from Jerry Ryan, a local men’s shop that was incredibly helpful. They worked within our price range and offered great advice on the ties. Dan at Jerry Ryan was a dream to work with and instantly put everyone at ease. The watch you see in the pictures, is an heirloom from Ambrose’s grandfather but the band was missing. I found local leather worker, Jim at Tandy Leather, custom make the strap as a wedding day gift. He was incredible and even made a Celtic knot wallet as well for Ambrose as a wedding present. The plaids are representative of our Scottish families (Munro and Guthrie); we used them for a traditional hand fastening ceremony to tie our families together. Rufus loved all the attention and got ready with the guys as well, lint rollers ensued. Stay tuned for Part II of the wedding next week and don’t forget to enter the giveaway with the Downtown Omaha Marriott at Capitol District! !